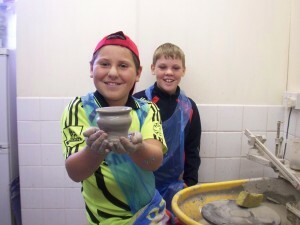 Our traditional working pottery has developed activities which cater for a wide range of ages, skills and abilities. We can easily tailor any session for you to suit your individual needs. The main aim of our outreach services is to engage with as many groups of people, young or old, as possible. If getting to us is a problem because our equipment is portable we can come to you. Among the many groups we have worked with are the Brownies and Scouts, WI and U3A. We have also worked with The Stroke Association and Carers respite, retirement homes and special needs of various kinds as well as schools and charities.